"So by the grace of Lord Caitanya, this movement is already introduced in the Western countries, beginning from New York. 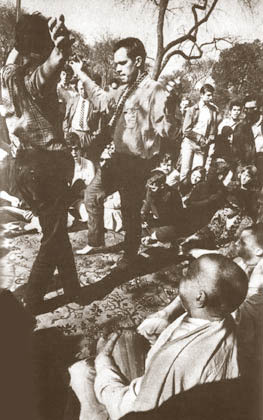 Our sankirtana movement was first introduced in New York in 1966. At that time I came and began to chant this Hare Krsna mantra in Tompkins Square. I was chanting there for three hours with a small mrdanga (drum), and these American boys assembled and gradually joined, and so it is increasing."